Njörðr is from the Vanir tribe of gods, and found himself amongst the Æsir when the warring tribes declared a truce and exchanged hostages. He also arrived with his children, the twins Freyr and Freya. 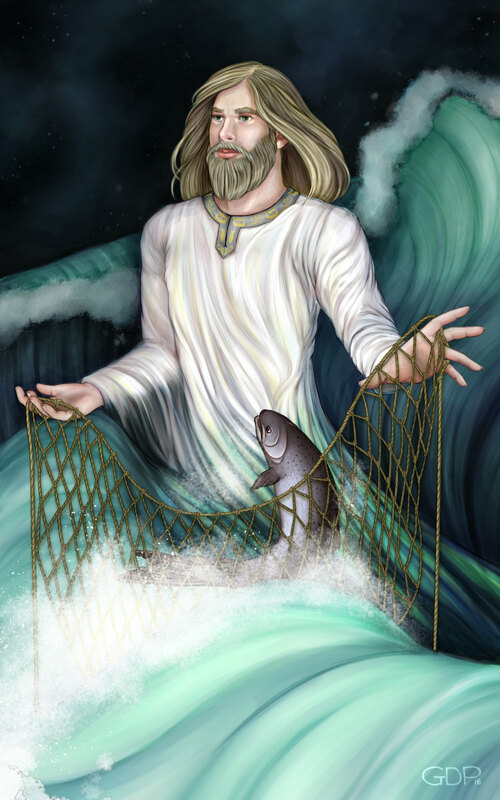 His name may mean “force” or “power” and he is the Ásgardian god of the sea, merchants, and commerce. Njörðr is attested in the Poetic Edda, the Prose Edda, and Snorri’s Heimskringla. His name also appears in Hauksbók, a 14th century Icelandic manuscript written by Haukr Erlendsson, in which he is one of three gods invoked in a ring oath. Numerous Scandinavian place names exist in his honour. He may be mentioned in the Gesta Danorum, as Hadingus. In Grímnismál, Njörðr is described as a “prince of men” who is “lacking in malice” and who rules over a “high-timbered temple” in his realm of Nóatún. In the Prose Edda, Njörðr is not only god of the sea, but he rules over the winds, having the ability to calm both sea and fire, and he can be invoked by sailors and fishermen alike. He is considered to be a very wealthy and prosperous god, even amongst the Æsir, and that he can also grant wealth in land and valuables to those who request his aid. He eventually marries the jötunn goddess Skaði, and in the poem Sólarljóð, he is said to have nine daughters in addition to his famous twins, though only two are listed – the eldest Ráðveig and the youngest Kreppvör (this may be a parallel or muddling of the nine daughters of Ægir, the jötunn god of the sea, who also had nine daughters – the mothers of Heimdallr.) The mother of Freyr and Freya is theorized to be Nerthus (sometimes called Njörun) Njörðr’s own sister, which seems to have been a theme amongst the Vanir gods. By far the best known of Njörðr’s tales is his marriage to Skaði. The determined jötunn stormed into Ásgard after the death of her father, demanding her choice of husband as part of her compensation for the loss. She was of course after beautiful Baldr, but she was forced to choose her spouse by his feet only. She picks the most attractive set of feet, but immediately discovers that they’re attached to the sea god, Njörðr. Her initial disappointment dissolves as she discovers how kind and stable her new husband-to-be is. for the screeching of the birds. The two continue to alternately visit the two locations, and also enjoy their own personal times within the realms. It is often theorized that the two divorced, but there is much more evidence to the contrary, which makes them a pleasantly unconventional marriage in the eyes of a modern reader. As a bountiful god of wealth and prosperity, Njörðr is still actively invoked by Heathens around the world. As with all the Norse gods, he’s not a cosmic cash machine – you’ll need to do the work. It is revealed by Loki that Njörðr slept with his sister to produce Freyr and Freya (and also hinted at that Freya may have also slept with her brother – those Vanir, I tell ya!) and even though this sister is not specifically named, it makes sense that it would be Nerthus. The fact that most brother-sister pairs were also complimentary (take Freyr and Freya again, two sides of the fertility coin) makes Nerthus an even more convincing lost sister of the sea god, as she is a goddess of fresh water and transitional boundaries between water and land. As in many other cases, holes in the lore have caused centuries of confusion and muddling, and Nerthus has developed several other names, been combined with other goddesses, and been dismissed altogether in some cases. The Vanir are the gods of the human tribe, presiding over all things cultural, social, and ancestral. Many prayers and invocations for Njörðr still exist from Scandinavia, and he is a kind and approachable god for modern Heathens. He is similar to the Roman god of seafaring and fishing, Triton. Water, especially seas and oceans. Sailboats and wind. Trade vessels, fishing equipment, and bustling ports. Coins, gold, jewels, and other forms of wealth and currency. Sea birds, fish, whales, and other ocean animals. The sign Pisces. Especially beautiful feet! Njord, Njoerd, Njorth, Hadingus, and Njor.